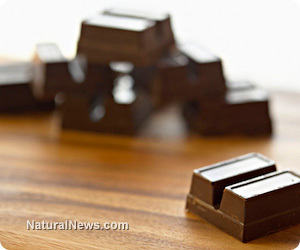 (NaturalNews) Good news for all you chocolate lovers out there, new research has found this divine food has even more health boosting advantages than previously recognized. Not only does it enhance both cardiovascular and mental well-being, but it also lowers body mass index (BMI) and insulin resistance. However, before consuming chocolate with wild abandon, it's important to discern between the different varieties - and choose only superfood grades for ultimate benefit. Relished for over 3,000 years, chocolate (also known as cacao in its purest form) has been used as a potent tonic, aphrodisiac and mighty food across cultures and continents. The ancient Aztecs raised cacao worship to new levels, reserving it for royalty and specific ceremonies. Europeans stumbled upon the delights of this strange 'almond' while exploring the New World and quickly adopted it as a remedy for fevers, mental fatigue, tuberculosis, poor digestion and gout. Fast forward to the present day and modern research has uncovered still more health enhancing features of this magical bean. Containing a cornucopia of beneficial compounds, cacao has been shown to alleviate a wide-range of health complaints. But to reap the benefits, only high quality chocolate will do. Focus on raw, organic, dark cacao. And remember, the higher the percentage of chocolate, the lower the sugar. Below are some of the perks associated with this tasty superfood. Cardiovascular - Of all the known edibles, cacao ranks the highest in beneficial antioxidant polyphenols that curb heart disease. A study at the University of California Department of Nutrition in Davis demonstrated the superior properties of a cacao rich beverage on platelet aggregation, thereby curbing heart harming blood clots. Even moderate consumption of cacao can reduce stroke risk and blood pressure while lowering cholesterol. Brain - A wealth of mood-modifying elements, cacao has a positive effect on the mind. Theobromine, phenethylamine (PEA) and anandamide present within chocolate stimulate the central nervous system while promoting positive, clear, and some claim, blissful mental states. Cacao also encourages production of the feel-good neurotransmitter serotonin which soothes depression, anxiety and irritability. Diabetes prevention - A small Italian study at the University of L'Aquilia discovered that participants who consumed the equivalent of a candy bar's worth of dark chocolate over the course of 15 days reduced insulin resistance by almost half. According to lead researcher Claudio Ferri, M.D., "Flavonoids increase nitric oxide production. And that helps control insulin sensitivity." Stress reduction - As reported in Women's Health Magazine, "Swiss scientists (who else?) found that when very anxious people ate an ounce and a half of dark chocolate every day for two weeks, their stress hormone levels were significantly reduced and the metabolic effects of stress were partially mitigated." Sun protection - Rich in skin protecting flavonols, dark chocolate is a smart choice. British researchers discovered that participants who consumed nutrient dense cacao over the span of three months had significant reduction in the speed of developing sunburns. Lower BMI - Research published in the Archives of Internal Medicine revealed that out of 1,000 Californians between the ages of 20 and 85, those who consumed chocolate on a regular basis had lower body mass index ratings. Dr. David Katz of Yale University remarks in the Huffington Post, "antioxidants might play a role in reducing inflammation, and that dark chocolate in particular might help balance the hormones that facilitate weight control." Looking for more benefits? Cacao also boosts cognitive ability, reduces tooth decay, calms coughs and improves vision.